In 1904, Douglass began his scientific study of tree rings (also called “growth rings”) or dendrochronology (dendro = “tree”). In 1914, Douglass was approached by Clark Wissler of the American Museum of Natural History about using his tree ring timing to date Native American ruins in the southwestern United States, a successful project that continued for fifteen years. In addition to studying patterns in climate change and the age of archeological ruins, dendrochronology has been used to date glacial movements and volcanic eruptions. When the trunk of a tree is cut horizontally, we see tree rings, with each ring marking the passage of one year of tree life. These rings are the result of new growth in the vascular cambium layer of cells nearest to the bark. Early in the growing season, the cells are thin-walled (earlywood), and thicker cells (latewood) are produced by the tree later in the season. One annual ring is marked from the beginning of earlywood to the end of latewood. Rings represent new vascular tissue that transports water and nutrients up the tree into the leaves. During the growth season, large tubes open to permit the flow of greater volumes of water, while during the dormant and drier season, the new ring growth is reduced and the tight tubes reflect a lesser amount of water transported. Tree growth is dependent upon such climatic factors as weather, rainfall, temperature, plant nutrition, soil activity, and carbon dioxide concentration. SEE ALSO: Land Plants (c. 450 Million BCE), Devonian Period (c. 417 Million BCE), Gymnosperms (c. 300 Million BCE), Plant Nutrition (1840). 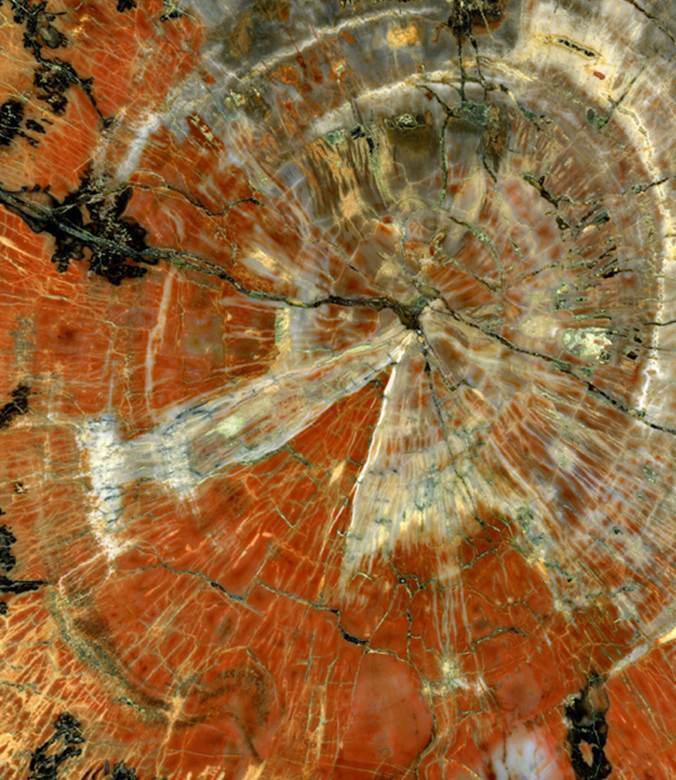 An image of the middle of a polished slice of a petrified tree from Arizona, showing its tree rings. An enlargement of the image enables one to see insect borings in the wood that date back 230 million years.